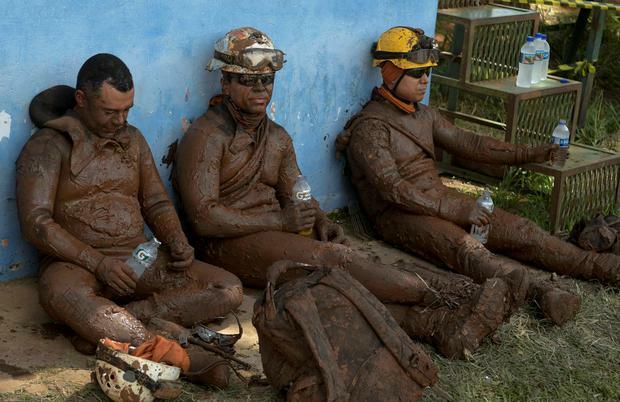 Brazilian firefighters are picking through treacherous mud in the search for survivors or bodies after a dam collapse that buried an iron mining company's buildings and inundated nearby neighbourhoods with ore waste. The confirmed death toll rose to 65, with 279 people still missing, according to the fire department in the south-eastern state of Minas Gerais. No one was recovered alive on Sunday, a stark difference from the first two days of the disaster when helicopters whisked people out of the mud. The death toll is expected to grow "exponentially" on Monday, Minas Gerais fire department said. Search efforts were extremely slow because of the treacherous sea of reddish-brown mud that surged out when the mine dam breached on Friday afternoon. The mud was up 24ft deep in some places, forcing searchers to walk carefully around the edges of the muck or slowly crawl on to it so they would not sink. Rescue teams on Monday focused their searches on areas around the Vale mining company, where many workers were eating lunch when the dam ruptured. Vale is the world's largest producer of iron ore, the raw ingredient for making steel. The Brazilian company's American depository shares plunged 15.8 per cent on Monday on the New York Stock Exchange. Helicopters looking for bodies took off and landed non-stop, while on the ground, dozens of rescuers with tracking dogs were searching for bodies through the mountains of mud. 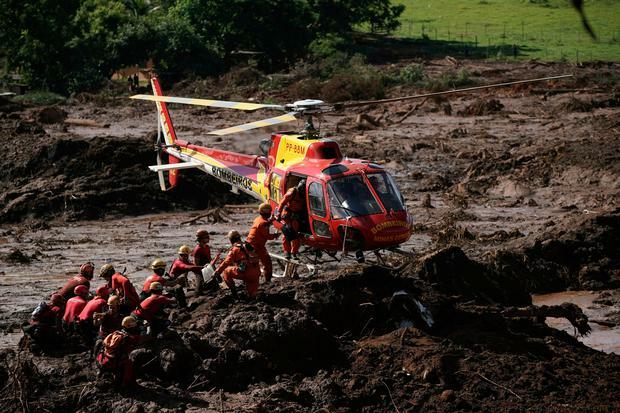 Rescue efforts were suspended for about 10 hours on Sunday because of fears that a second mine dam in Brumadinho was at risk of failing. About 24,000 people were told to get to higher ground, but by afternoon civil engineers said the second dam no longer posed a risk. Areas of water-soaked mud appeared to be drying out, which could help firefighters get to areas previously unreachable, but it was slow going for the search teams and some residents started searching on their own for relatives. Throughout the weekend, there was mounting anger at Vale and questions arose about an apparent lack of a warning siren ahead of Friday's collapse. Vale said the area has eight sirens, but "the speed in which the event happened made sounding an alarm impossible". Senator Renan Calheiros called for Vale's board of directors to step down and attorney general Raquel Dodge told reporters that its executives could be held responsible. According to Vale's website, the waste is composed mostly of sand and is non-toxic, but a UN report found that the waste from a similar Brazilian disaster in 2015 "contained high levels of toxic heavy metals". That dam, operated by Vale and Australian mining company BHP Billiton, collapsed in the city of Mariana in Minas Gerais, killing 19 people and forcing hundreds from their homes. About 250,000 people were left without drinking water and thousands of fish died. An estimated 60 million cubic meters of waste flooded nearby rivers and eventually flowed into the Atlantic Ocean.